Imagine is perhaps the best and most well known song of John Lennon’s solo career. Like most Beatle fans, I’ve often agonized over the break-up of the Beatles (although not at the time, it's hard to get worked up over that at age 4). Like most, I’ve often imagined the great music that would have been created had the Fab Four stuck it out. 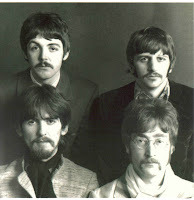 Then one day it hit me: the solo careers of John, Paul, George and Ringo – when viewed as a group, would in my view rank as the best band of the 70’s (not much of a stretch to picture the Beatles together in such fashion as on one hand there was continued collaboration amongst the four on post-Beatles work and on the other hand, the white album really was the compilation of the work of four individuals). So here is my shot at the ten best solo works of the Beatles.